Accusations of being a spirit – this can happen if a family feel they have experienced bad luck since their birth (such as a death or crop failure), and can result in babies being abandoned or even killed in an attempt to send them back to their ancestors. Babies typically stay at the Centre with their mother or a female relative in the absence of their mother. Stays range in length, but when the child is healthy and the carer is fully informed on how to care for them, they are resettled back into society with their progress monitored by Sister Jane. 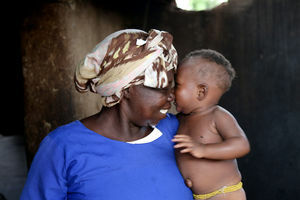 Operation Smiles provides direct support for babies as well as local community support in the hope to tackle the root causes behind babies needing the project’s care – for example, to lower teenage pregnancies which exacerbate the high maternal and infant mortality rates. Sister Jane is a trained nurse and partners with other health professionals to deliver community talks attended by hundreds each time. They speak about family planning, the importance of midwives and giving birth in a health facility, ante and post-natal care, birth spacing, reproductive health and how and when to access medical care. 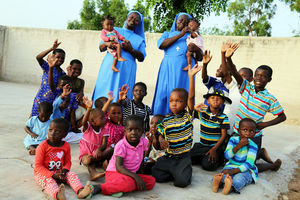 Please look at our website for more information on the project and to find out more about AfriKids.